ASB Avionics LLC (ASB) under contract with the University Corporation for Atmospheric Research (UCAR) is performing ASB’s FAA Certified, Commercial Off The Shelf (COTS), Avionics Modernization Program (AMP) on National Center for Atmospheric Research’s (NCAR) EC-130Q research aircraft. The ASB AMP is centered on the 5-display Honeywell Control Display System for Retrofit (CDS/R) Electronic Flight Instrument System/Automatic Flight Control System (EFIS/AFCS), triple Micro Inertial Reference Sensors (µIRS), triple Flight Management System (FMS), dual Global Positioning System receivers (GPS), an ASB developed Engine Indicating and Crew Alerting System (EICAS), and Dual Communication/Navigation/Surveillance systems (CNS). The ASB AMP replaces all existing analog flight director, altimetric, and engine displays, autopilot and flight director components, and existing CNS components, substantially reducing Line Replaceable Unit (LRU) and wire count. The high Mean Time Between Failure (MTBF), low acquisition costs, and auto-flight characteristic improvements help in reducing Life Cycle Costs (LCC) and improving functionality, safety, and useful life of the NCAR EC-130Q airframe. ASB’s COTS AMP includes dual digital Air Data Computers (ADC), TCAS-II, EGPWS, integration of the existing C-Band radar, and replaces the existing pitot/static sensors. Also included are Advanced File Graphics Servers (AFGS) and dorsal mounted HF Shunt Antenna. The flexible architecture of the CDS/R-AFCS allows for future growth to accommodate changes in civil or Government air operating regulations. The National Center for Atmospheric Research (NCAR) based in Bolder, CO, USA, conducts collaborative research in atmospheric and Earth system science, and provides a broad array of tools and technologies to the scientific community, including research, supercomputers, and instrumented aircraft and observing systems. 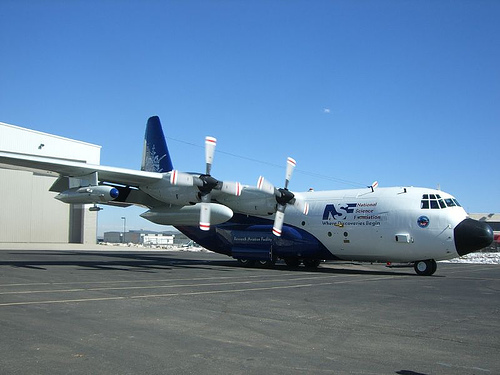 The NCAR EC-130Q Hercules aircraft supports observational research studies of atmospheric chemistry, cloud physics, mesoscale meteorology, boundary-layer dynamics, air-sea interactions, oceanography, and other fields within the atmospheric sciences. The University Corporation for Atmospheric Research (UCAR) based in Bolder, CO, USA, promotes partnership in a collaborative community dedicated to understanding the atmosphere and the complex processes that make up the Earth system, from the ocean floor to the Sun's core. The University Corporation for Atmospheric Research manages the National Center for Atmospheric Research under sponsorship by the National Science Foundation.